it was a great whole day activities. really enjoyed the history of ancient capital, biking, and boating. Back in 968 and until 1009 (under the Dinh Dynasty), Hoa Lu was the capital city of Vietnam. And even though the title was taken by Thăng Long in 1010, the city remains a treasury of historical interest to this day. 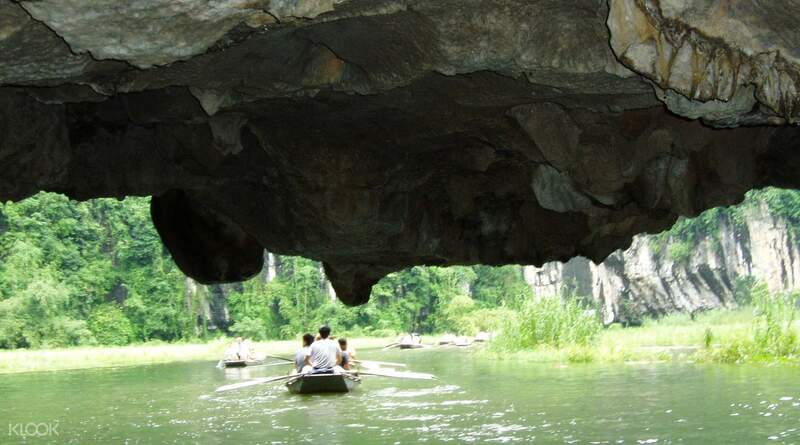 The Hoa Lu - Tam Coc Day Trip takes you on an exciting adventure through natural and cultural landmarks. 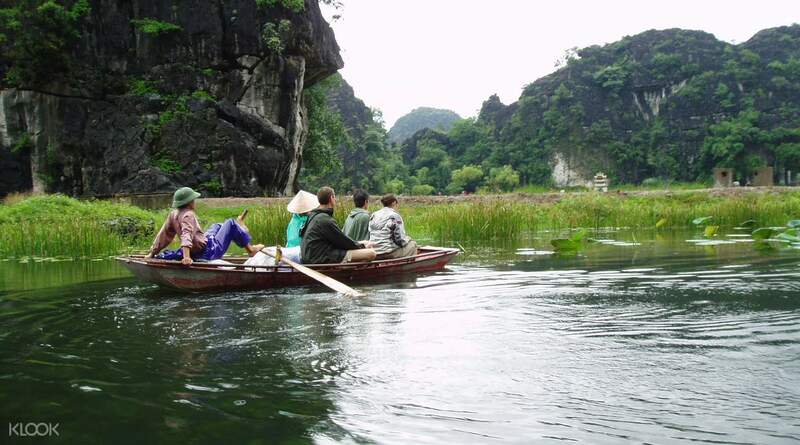 After hotel pick up in Hanoi, you start off in Ninh Binh and hop on a boat in Tam Coc. 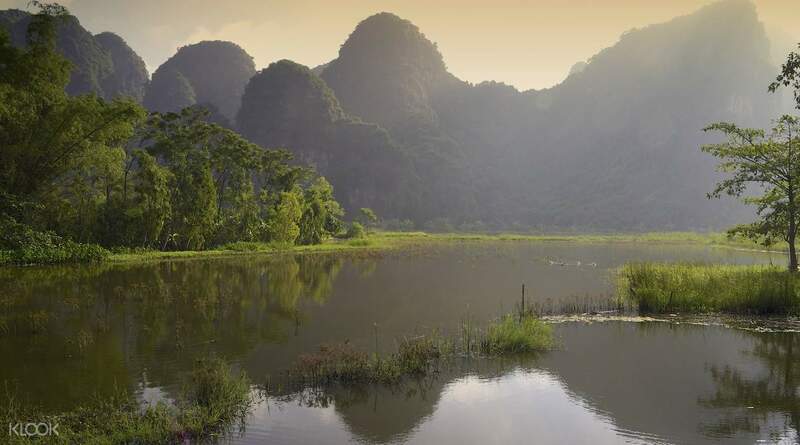 Passing through caves and limestone karst formations, you get to explore Vietnam’s landscape in all its diversity. After lunch at a local restaurant, you go on to visit the temples of Dinh and Le Dynasty before heading back to Hanoi. guide was friendly and shared sufficiently to get a gist of Vietnam's imperial history, yet without going into too much detail. The route is scenic, and doesn't feel too touristy yet as compared with Halong Bay. will defo recommend this as a must visit day trip option from Hanoi. But do note that the bicycles aren't in great condition, so do select your bikes carefully. guide was friendly and shared sufficiently to get a gist of Vietnam's imperial history, yet without going into too much detail. The route is scenic, and doesn't feel too touristy yet as compared with Halong Bay. will defo recommend this as a must visit day trip option from Hanoi. But do note that the bicycles aren't in great condition, so do select your bikes carefully. Great tour guide and nice tour all in all. We learned a lot. It was a little bit unfortunate for me (in Tam Coc) since I don't know how to ride a bike so I was left just walking around. Lunch was good, too. Definitely would recommend this tour. Great tour guide and nice tour all in all. We learned a lot. It was a little bit unfortunate for me (in Tam Coc) since I don't know how to ride a bike so I was left just walking around. Lunch was good, too. Definitely would recommend this tour. Love the variety of activities: temple visit, cycling around town, and boating through river caves. The lunch buffet was nice too. Could still improve if the tour guide/boatmen had better, more interesting spiels about the history and features of the place. Love the variety of activities: temple visit, cycling around town, and boating through river caves. The lunch buffet was nice too. Could still improve if the tour guide/boatmen had better, more interesting spiels about the history and features of the place. 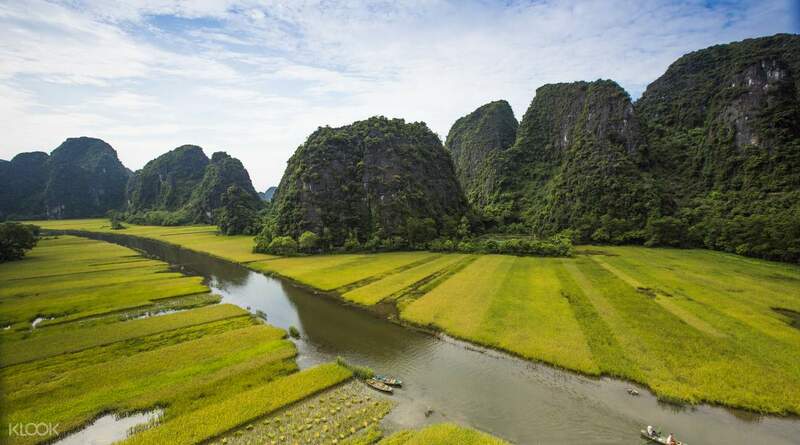 hotel pickup was punctual, transportation was safe, tour guide was interactive with guests and knowledgeable about history of ancient sites, activities were as scheduled without delay, it's a great experience in Ninh Binh! hotel pickup was punctual, transportation was safe, tour guide was interactive with guests and knowledgeable about history of ancient sites, activities were as scheduled without delay, it's a great experience in Ninh Binh! Overall the tour wasn't perfect but very good value and well planned. The tour guide (Tam) was friendly and gave detailed information before arriving at each stop. The driver (Long) drove safely all the way. The activities were enjoyable but Hoa Loa was a bit short. The bikes weren't in good condition and the buffet lunch was so so bit better than expected. The bus seats were okay. Overall the tour wasn't perfect but very good value and well planned. The tour guide (Tam) was friendly and gave detailed information before arriving at each stop. The driver (Long) drove safely all the way. The activities were enjoyable but Hoa Loa was a bit short. The bikes weren't in good condition and the buffet lunch was so so bit better than expected. The bus seats were okay. Thi was the best part of my Vietnam trip. What made this tour great was our tour guide, Circus (i forgot his Vietnamese name). He was funny, attentive, and informative. Along the way he shared some informatiom about the country. He also taught us some Viatnamese words and introduce the Vietnamese alphabet. We learned some basic pronunciation and even had the group compete who was able to pronounce the words right. He was prepared with some visual aids. Circus gave us some good infoantion about our destinations as well as some trivia. He was never boring. I also like it that he gave us some information about the prices so we won't get scammed by vendors. Over all it was a good experience. I love the cycling activities. The buffet lunch was good with so many selections. The bamboo boat was the highlight. It was such a lovely experience. 5star. Highly recommended. Thi was the best part of my Vietnam trip. What made this tour great was our tour guide, Circus (i forgot his Vietnamese name). He was funny, attentive, and informative. Along the way he shared some informatiom about the country. He also taught us some Viatnamese words and introduce the Vietnamese alphabet. We learned some basic pronunciation and even had the group compete who was able to pronounce the words right. He was prepared with some visual aids. Circus gave us some good infoantion about our destinations as well as some trivia. He was never boring. I also like it that he gave us some information about the prices so we won't get scammed by vendors. Over all it was a good experience. I love the cycling activities. The buffet lunch was good with so many selections. The bamboo boat was the highlight. It was such a lovely experience. 5star. Highly recommended. We had a really lovely day. Our tour guide Kimi was excellent. Made the trip much more enjoyable. The visit to Hoa Lu and the two Temples was interesting but a little underwhelming until you realise they relocated the stone from the ancient city to Hanoi. 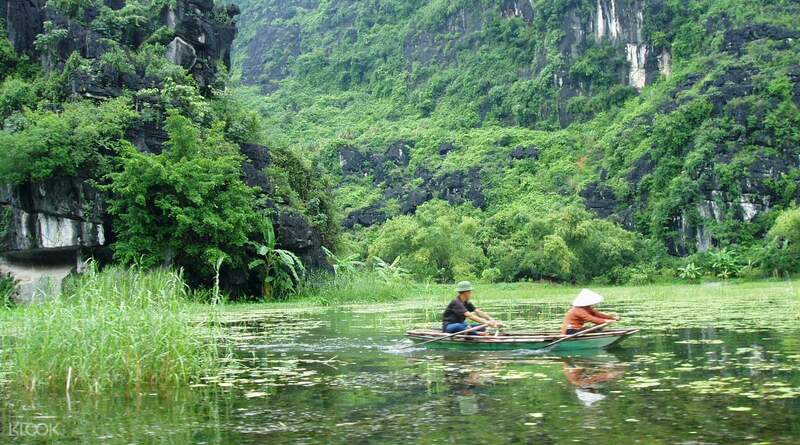 Tam Coc is such a beautiful area. The bike ride was ok. It was good to see the surroundings but the paddy fields were all harvested so nothing much to see. The highlight of the trip was really the boat ride. The 8km stretch was rowed by our tower using pretty much her feet. Beautiful scenery and impressing caves. So relaxing and peaceful. The limestone cliffs were very dramatic and you can see why they used it as a set for the King Kong Skull Island film. I would really recommend the trip. We were deciding between Halong Bay and Tam Coc but we were pleased we chose Tam Coc because it was 2 hrs less on a coach. It’s good value for money and Klook came up trumps again. We had a really lovely day. Our tour guide Kimi was excellent. Made the trip much more enjoyable. The visit to Hoa Lu and the two Temples was interesting but a little underwhelming until you realise they relocated the stone from the ancient city to Hanoi. Tam Coc is such a beautiful area. The bike ride was ok. It was good to see the surroundings but the paddy fields were all harvested so nothing much to see. The highlight of the trip was really the boat ride. The 8km stretch was rowed by our tower using pretty much her feet. Beautiful scenery and impressing caves. So relaxing and peaceful. The limestone cliffs were very dramatic and you can see why they used it as a set for the King Kong Skull Island film. I would really recommend the trip. We were deciding between Halong Bay and Tam Coc but we were pleased we chose Tam Coc because it was 2 hrs less on a coach. It’s good value for money and Klook came up trumps again. A wonderful trip on a Cloudy day. The bus pick us up about 8.45 at the hotel we stayed as it has to pick many other tourists from other hotels in Old Quarter area. We reached How Lu to visit the old Temples where the 1st and 2nd King of Vietnam lived. We learnt some interesting history about Vietnam and found the temples full with heritage from Old Tang dynasty. We had our delicious buffet lunch just a few minutes away from the temples. There are plenty of food variety, but unfortunately we are quite run out of time. Tam Coc 1.5 hour boat ride is every interesting and we enjoy the unique scenery in a cooling afternoon. The bicycle ride allow us to cycle around the village with a good nature view and fresh air. Thanks Klook, Thanks Janice. A wonderful trip on a Cloudy day. The bus pick us up about 8.45 at the hotel we stayed as it has to pick many other tourists from other hotels in Old Quarter area. We reached How Lu to visit the old Temples where the 1st and 2nd King of Vietnam lived. We learnt some interesting history about Vietnam and found the temples full with heritage from Old Tang dynasty. We had our delicious buffet lunch just a few minutes away from the temples. There are plenty of food variety, but unfortunately we are quite run out of time. Tam Coc 1.5 hour boat ride is every interesting and we enjoy the unique scenery in a cooling afternoon. The bicycle ride allow us to cycle around the village with a good nature view and fresh air. Thanks Klook, Thanks Janice.